This Fineline Quenchers 402-CL 2 oz. clear plastic shot cup is the perfect petite size for drink samples and bar shots. This disposable cup maintains a clean and fine appearance while eliminating the risks of permanent beverageware, including transportation, cleaning, and breaks. Fineline cups are excellent for bar service. They are a great size for all kinds of shots. The elegant design makes them a great substitute for real glassware. They stack very easily to eliminate clutter from behind the bar. We have used these plastic shot cups for our wine tasters at events for years. Our legal pour is 1 oz., so it's easy to pour legally, and it's nice for the customers to have some room at the top of the taster glass so they don't spill. We will continue to buy for years! The Fineline Quenchers 2 oz. Plastic Shot Cup is much higher quality than I expected. I use them during trade shows for samples which means they get moved around in large bins a lot and they never break or crack. These shot glasses were the perfect size and durability to used for a whiskey bar tasting that we recently had. A nice quantity so that guests could sample all the various whiskeys. I bought these to use as shot glasses for a wedding reception. They were perfect size and kept me from having to buy 200 glass shot cups. The Fineline Quenchers 2 oz. Plastic Shot Cup - 50 / Pack is a wonderful disposable shot glass! I highly recommend this item for anyone needing a disposable shot glass! These shot glasses fit great on my bar at home and they make for an easy clean up after each and every party. For this price, I will keep on ordering these. I bought these for a wedding. They are simple and pretty. They are sturdy enough, though I have had problems with them cracking if not handled correctly. Good price. These cups work great when wanting something small for individual parfaits or other type of foods or candy. They look nice and are sturdy and a good buy. These cups are perfect for my mini cheesecake parfaits. They are sturdy and perfect for the price. I will be ordering these again for sure. I ordered these and made veggie and dip cups out of them! The guests loved them and they looked much nicer than the traditional veggie tray! I really do love these plastic shot cups, they hold up nicely and aren't too flimsy. Never worried that they might fall or tip over! this is awesome for the price. Guests ask where I purchased this! Will be ordering more for future events!! convenient! thanks you for this product!! These cups are perfect for making mini desserts. They held up well while we were filling them, being served, and eaten out of by our guests. Used the Fineline Quenchers 402-CL 2 oz. Plastic Shot Cup 50 / Pack to serve Candied Yams. 2 oz plastic shots are perfect for having your guests wanting for more. The cups are so sturdy. these shot cups are sturdy and hard to break. they will not be too good for jello shots because they are not flexable enough to get the jello out unless you want to use a spoon....then there is always that. but as for shot glasses, they are fine. Fineline makes great plasticware for catering. I use these shot cups for beverages and food. Hot or cold works and they are are sturdy. Great product. This cup is beautifully clear for a plastic disposable cup and the price is right, too. Don't forget though, it is tiny, at 2 ounces. Good price on these. For disposables I wish ground shipping wasn't so much for one thing or I would order smaller quantities a lot more often. PERFECT SIZED SAMPLE CUPS. They are just big enough to put a mini straw in for a mini drink presentations. Good and study and crystal clear. Nice little cups. This awesome plastic 2 oz shot glass just hook for your parties at any time great products i recomended this for all your party needs goos shot for this!!!! These served as shot glasses at my wedding. Note! These are hard plastic cups so they are not ideal for jello shots as they would crack not band but I knew that buying these so 5 stars! Hard enough to last through the drunks who order shots. They aren't made to last too long but good enough to last through a party. Have to say it, I love FineLine products. Not only are they cheaper than most but the quality can't be beat as well. I bought this item for the purpose of making desert shots for my Dad's party. I made different kinds of desert and placed them on these plastic shots. The desert table looked really colorful and festive. I buy these little cups in bulk, and they are the best-looking and durable plastic cups that I have ever used - I highly recommend them and will continue to purchase them - thanks Webstaurant! Perfect size for shots for our backyard wedding. Great quality. Clear plastic. Very elegant. You will not be sorry. The 2oz is the way to go. These mini shot glasses are perfect for your delicious desserts. They're the perfect size for your guest and they look beautiful on a dessert table! Beautiful little cups that we use to hold nuts and candies as party favors for parties and receptions. It's nice size for individual servings and easy to see what is inside. I absolutely LOVE these shot glasses For mini desserts. I had been searching for something to make mini desserts in for quite some time and didn't want to spend a fortune. The price for these cannot be beat compared to other products I found. Great price for disposable shot glasses. I looked around before buying these and Webstaurant had the best prices. This is a quality product that could also be used for dipping sauces. I was looking for disposable shot cups and these shot cups were perfect. If you are looking for a high quality disposable shot cup, these are it. These cups are sturdy and the perfect size for dessert shooters! They also match perfectly with the silver tasting spoons (sold on this site) and really make the sweets look elegant! We love these little shot glasses for soup shots, dessert cups and for frosting shots as well. They are sturdy, elegant (they do not look like they are plastic!) and we use them everyday! I order tons and tons of these. Individual desserts. Individual chilled soup shooters. Cocktail sauce in the bottom or a garlic aoli with a poached ship in it. People at parties love it because it doesn't require a plate and is the perfect bite size. good shot glasses. Could very easily use to make jello shots or at a party for easy clean up. very convenient glad we started using them. We use these clear plastic cups for wine tasting in our retail store in Panama City Beach. It sure beats washing glasses all day long! These were great. both the 1 oz and 2 oz are perfect for different things. I like that they are crystal clear and look more upscale without breaking the bank. perfect for home parties are disposable catering. 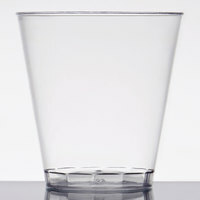 These 2 ounce plastic shot cup is perfect for serving granitas in between courses! Even though they are plastic they are easily reusable! Nice price for 50!!! I love this size of cups. I wish they came in a smaller quantity as i do not need this many for home use. But they are good quality and good size. Hello Sherry, and thank you for your review! Please see item 999PC200 to purchase this product in packs of 50. Ok, I highly recommend these shot glasses! They are disposable and I used them for Shrimp Shooters. They are the perfect size for the cocktail sauce and one Shrimp. I have used these at two different functions and they are a hit! I bought the 2oz plastic shot cups for catering jobs. The cups are good for drinking, dessert shots, and mini shrimp cocktail. Could value for the price. These shoot cups are just the right size. They are a quality product. I order them all of the time. Will continue to order them. This product works well for shots, or product sampling. Product has high quality and looks nice. Also it is packaged in 50s -- great for resale. great shot cup for your bar or night club. we purchased one case to test them against what we have been using . we will be purchasing this shot cup NOW and in the future. Cute for shot glass chocolate mousse or for passed cold soup appetizers. Also they work great if you're offering samples during a demonstration--I built a mini trifle in them and it looked fantastic. Very nice considering they're plastic and inexpensive! We like these plastic shots for behind the bar, because we live in a college town and a lot of the students try to steal the glass ones. These cups were purchased for my son's birthday party. He had a casino theme and I thought it would be a great idea to have virgin shot drinks. I ordered both cup sizes. They were a big hit. I really Love these. I do Chocolate Tasting Parties. I fill these with chocolate mousse and it looks really NICE! I also use them to serve hot sipping chocolate samples these are very versatile. These cups are great for a number of applications. I have used them for soups, shots, and various desserts and they have worked out very well. I have no complaints and would definitely buy these again. These shot glasses are great for shooters. They are economical and look great. Have reordered them several times. Just be sure that your bartenders know that they are 2 oz.